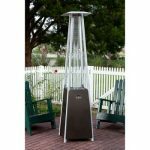 The golden flame resort pyramid style patio heater is in the higher price range but it seems that you get what you pay for. We found that this patio heater is actually from the Fire Sense company. Why they did this under an other brand name? No idea. The ratings are also higher and that means a lot of course. We will see if this pyramid patio can live up to these high ratings in our in depth review. Golden Flame is a respected seller in the market of outdoors and well know for its outdoor furniture and quality products. This pyramid shaped patio heater is CSA approved this means it is tested and approved for the US market and this is an extra safety feature we like to see. An other safety feature is the auto shut off for if the unit tilts over to far. This smart system quickly shut down the unit if it is tipped over. Even when you forget to turn it of before moving it this will turn the unit off. I guess these are the main features and they are not so much different from other patio heaters. The quality of this Golden Flame however is a lot higher than many other patio heaters. The option to put sand in the bottom for more stability is something I have not seen before. This weight in combination with the propane gas tank makes it to a very stable construction. This unit measures 21 x 21 x 91 inches. The square base is because the wheels are under the base and do not stick out like with some other models, Personally I like this very much because you do not see the wheels. The weight is 60 pounds but 64 pounds is the shipping weight. Q: How much sand does the base needs? Q: How long does one tank last? We always look at the low ratings first to see if we find similarities in them that are cons. We could not find to may bad reviews and to be honest 92% of the ratings were 4 and 5 stars. That is already a pretty good indicator in my opinion. The packaging got real good ratings and no one complained about the unit being damaged in the packaging. About the assembling the opinions were a little more divided. This is depending on how much of a “handy man” you are. If not, ask some help from a friend. Many experienced people mentioned it takes about one hour to put together. One thing we found is that most people advise to add the sand first before proceeding with the assembly. Most users wrote that it lighted fast and easy. It seems that the unit got some improvements in recent years. Some people mentioned that this unit is better than the older model. The ignition and the glass tube seem to be improved quality. Read all customer reviews here!! That is a mouth full. Let us begin with that we found that this is a Fire Sense product. Why it is sold under an other brand name we have no idea about. It just explains better why it got such good ratings. Some people expect a patio heater to keep them warm in a cold winter in the north. This is not going to happen of course. a patio heater like the one you read about now, is made for cool summer nights. Maybe in a screened in porch you can use it on a colder night or season. The radius it will keep warm also depends on the outside temperature and other circumstances like wind. We have read a lot of comments from buyers and users and we can only come to the conclusion that this pyramid patio heater is a good buy for the money. Yes, it is not cheap, but you get what you pay for in most cases. The stability improved by the sand in the base is rated very high. One of the reasons to buy a pyramid patio heater is the looks. You will not be disappointed here. This heater looks real nice on any patio or deck. I read a story that someone ordered 2 more after seeing the first one. 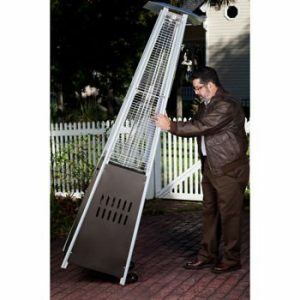 A cover for this pyramid patio heater is a great purchase to protect your heater from the elemnts. We found the following pyramid patio heater cover in Dark Brown and Mocha color. You can find it on Amazon ==>> by Clicking here!! For around 40 dollar. 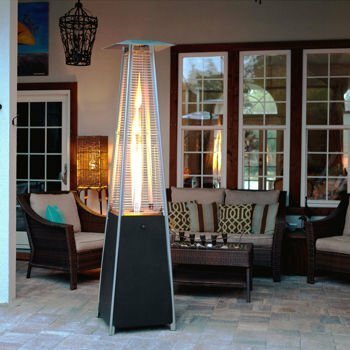 Read all our pyramid patio heater reviews ! !